In August I learned that Institute for Excellence in Writing (IEW) was letting members of the Schoolhouse Review Crew review various levels of their Fix It! Grammar program, and that I had been selected to review Fix It! 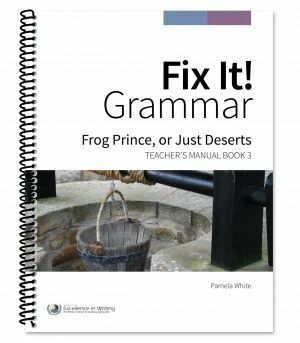 Grammar: Frog Prince, or Just Deserts [Book 3] (Teacher Manual) and Fix It! Grammar: Frog Prince, or Just Deserts [Book 3] (Student Book). I received my beautiful copies of the book promptly in mid-August, with a certain amount of concern and trepidation, hoping I had selected the appropriate level for my son. In spite of the fact that IEW makes available to the customer a very adequate Placement Test to help one determine the appropriate level, my son was less than cooperative in early August, holding on to his summer break with all his power. Extenuating circumstances such as these can influence the results one gets from a placement test. Fortunately, though, IEW had also provided Crew members with a link to a Webinar on their website which is also intended to help customers answer the question of which level to begin with, as well as providing some instruction on how the program works. Information provided strongly recommends beginning with The Nose Tree [Book 1], or if beginning with Robin Hood [Book 2], considering doing The Nose Tree simultaneously. Settling on which level to begin a program is not an easy task. These materials are appropriate for Grades 3 and up. My son is in 9th grade. He has some grammar background. If I started at too low a level, he would not be happy because if the level was all too elementary for him he would feel I was wasting his time requiring him to do the book. On the flip side, if I selected a level too difficult for him, he would become frustrated and uncooperative, and every lesson would be an agony. So, in spite of all the resources IEW provides to assist the customer with their decision of which level to select, I was still concerned as we entered into the program. Would it be too easy? Would it be too hard? Would the literature content be so silly that my son became uncooperative? Should I have selected Robin Hood, even though we covered that literature two years ago? We began our school year the last week of August, which gave me a week to familiarize myself with Frog Prince, or Just Deserts before presenting it to my son. The material and presentation looked very promising, but the nature of the literature still left me wondering how it would be received by my developing young man, and I was still unsure whether I had made the right decision when it came to the level I had requested. Get Ready: get the four sections of Fix It! Grammar organized, separated into "Fix Its" (student mark-ups of literature); Grammar Glossary (a section provided at the back of our Student Book spiral): Rewrite (a notebook section where student writes correctly the literature section that was previously provided needing "Fix Its"); and Vocabulary (a notebook section for student to write down vocabulary words and their definitions). Learn It: A section to be read through, teacher and student together, which covers the grammar and mechanics focus for the week and also has student find grammar cards for week to use and review. Fix It: broken down instructing student to read sentence, look up vocabulary word and enter in vocabulary section of notebook, and then breaks down how the student, with the teacher's assistance, will mark and fix passages or will use grammar cards to help student remember how to do what was taught in "Learn It". There are "Fix It"s for four days, so this program can be done nicely in four days per week. Rewrite: Instructs student to rewrite literature and gives specifics for how to do it. After reading through the first page, as I said, which explains the methodology of the program, we flipped the page to week 1. The program is laid out nicely. It is a spiral notebook, and when you open the book on the table in front of you, the left page gives the overview of what the focus of the week will be, whether an explanation of how to use commas with certain types of phrases or what to watch for when looking for words that need to be capitalized. So the written material to explain the week is on the left page, and the right page has the literature broken down into daily assignments. Very concise. Very nice. When my son saw it that way, he said, "Oh, is that all I have to do today?" Next we set up a 1" (3-ring) notebook to use for part of the grammar work. This notebook will be used for (1) rewriting the literature selections once the student has made appropriate corrections, and (2) writing daily vocabulary words and their definitions down in a growing vocabulary section. The assignments for the week are broken down so that they can be done in four days, so you do not need to assign grammar five days a week. The first assignment at the beginning of each week is to read the page on the left, which gives an introduction, some brief review, and an understanding of new material in bite-sized portions.The next step, each Monday, is to go to the back of the Student Book and check to see if there are any Grammar cards for the week. These cards gets used constantly, but no suggestions are made for ways to keep these cards nice and to keep them from getting lost. I decided a zipping plastic bag mounted to the inside of the front cover of the Student Book would work for us. Goes through the sentence(s) for the day and makes appropriate markings to "Fix It!" Consults with mom/teacher (who has the answer key), and together they go through the sentence(s) to see if student caught all the mark-ups and did everything correctly. Student goes to the 3-ring notebook and opens to the section he/she has set aside for the rewriting of the literature selections. Using his best writing, and observing all the correct punctuation and mechanics, he creates a place where the literature story is building, written with corrections he has made. Next the student finds the bold word in the day's selection. This is the day's vocabulary word. He writes it in the vocabulary section of his notebook, and then looks up the definition in the dictionary. (I permitted my son to look up the definitions on line.) He selects the definition that works best for the way the word is being used in the literature and writes it down. It is okay for him to write it concisely -- he doesn't have to write a long definition. It is very easy. So we got through week 1, and my son was liking the program. We worked on week 2, and my son was missing more of the mark-ups, and was not quite as happy. We worked on week 3, and he was starting to grumble and complain. It was time for me to take a closer look and figure out what the problem was. I figured it out pretty quickly. It was user error. The directions at the very beginning make it clear that at the beginning of each week the teacher is to go over the information of the week with the student before the student begins making the mark-ups. I had (silly me) figured that I could just throw the book at my son each Monday and that he would actually read the "Learn It" material himself, or that I could ask him to do his daily work and that he would on his own pull out the Grammar Cards to refer to as a help, etc. He was actually doing a great job of trying to work independently, but I needed to do more on my part. So I figured that out in Week 4. I can't say that it is now going completely smoothly at this point. Change and learning take time. I needed to work on this review on Monday, so my son and I slipped immediately into our previous pattern. He said, "I'll do my "Fix It" now." and I responded, "Okay, great!" Teacher error. Fix It! Grammar is a 6-level grammar series. The books I reviewed were the 3rd level. The Teacher's Manual sells for $19, and the Student Book sells for $15. The program can be used for all ages, 3rd grade and up. Use the Placement Test to determine whether to start at Level 1 or if you might be able to slide in starting at a higher level. Though it was an agony to come to the conclusion, it seems the 3rd Book was a great fit for my son in light of his previous grammar instruction. 1) Instructions on Grammar Cards should include a suggestion on storing the cards in a way they can stay handy and not get lost. 2) The instructions at the beginning of the book say to set up a notebook with four sections, and that the Fix Its are one section and the Glossary is one of the sections, but these two are actually embedded in the spiral. This makes no sense and should be adjusted. The notebook will only contain the Rewrites and the Vocabulary. 3) Granted, we've only had the books two months, and admittedly I haven't read as much (as the teacher) to my son as I should have, but I'm still not finding anywhere that tells me to use the Fix It! I've even scanned ahead through the weekly "Learn It"s and I can find no reference to it. Grammar Glossary. It is a beautiful, informative document, but if its use is not integrated into the instructions, it will be neglected. I think the first Instructions page should tell how it is to be used and I think the weekly "Learn It" pages should have assignments to read portions of it. My opinion. I love the Fix It! Grammar books that I received. I love materials that are well made and professionally created. These are high quality books, and so far I have not found a single (unintended) error or typo. Right now my son is not loving them, but his opinion waxes and wanes according to how well he "gets" the information, and right now it is clear to me that his failures right now are due to my poor implementation as the teacher, and not due to a problem with the program itself. I find he is not commenting negatively in any way about the content of the literature itself, the nature of the story (fairy tale), itself. I am surprised and pleased by this. I have a lot of grammar choices I might use for the rest of this school year (9th grade) but chances are I will stick with Fix It! Grammar Book 3 throughout this school year. I love something that is easy and effective. If you would like to read reviews by other members of the Old Schoolhouse Review Crew of this and other level books in the Fix It! Grammar program, click the button below. Here is my vegan/carnivore blended menu plan for this week. Last week I switched Friday and Saturday, serving Saturday's spaghetti on Friday (making a vegan version for me with vegan crumbles in the sauce), and bumping Saturday's roast chicken to later this week since the chicken was still frozen solid on Friday. So I am starting this menu plan with Saturday, since Saturday's plan had changed. Cheese burgers, rolls, green beans, lettuce tomato etc. Can you believe it's already the end of September? I can't. I meant to do this every week, and four weeks into the year I am finally starting. Well, it is what it is. Well, the week of 9/14 - 9/21 can be summarized this way. Yeah, we took our summer vacation three weeks into the school year. Notebooking Pages Giveaway and Contest! We are choosing 3 winners! Each winner receives a Notebooking Pages LIFETIME Membership and Map Trek: Ancient World (ebook) from Knowledge Quest, Inc.
Full disclosure: This page has affiliate links. I am writing up a series of letters my grandmother, Esther, sent "home" to her siblings in North Dakota as she traipsed around the world working for the State Department as a working woman before it was chic. Letters were chosen over phone calls because long distance calls were expensive, and it was sometimes difficult to hear well at a distance. This letter is the next letter I have from Esther by date. I guess you heard about the cyclone they had in Queensland. I'm waiting to get the news ticker to find out what towns it hit because I missed that on the radio. I hope it wasn't Ingham. I must write to Carl and Ellen too -- Its been ages since I did. Guess what? I'm going to play the Stars Bangled Banner at the American Community Picnic for the sporano who will sing it, using a little portable foot-peddal organ. [Star Spangled Banner? Soprano? Pedal?] She sings in our choir and our organist is going to be out of town. Of course I hadn't even planned on going but I guess I will have to now. They say they celebrate Washington's birthday as they would normally celebrate the 4th of July because its cooler now. The lady who will sing it is is Mrs. Hung, a Chinese-American. Her husband works in USIS. She does have a very nice voice but we have another soprano whose voice I like even better -- a Mrs. Lemon who is the wife of a missionary. She is singing the solo part in a number we are doing on Easter and it sounds just beautiful. I still haven't been able to find a good alto to help me out. How about coming out here? You would not like the weather, I'm afraid, although I love it. The coolest part of the day -- 6:30 in the morning -- they give the temperature on the radio and its been climbing up a notch every day or two lately. This morning it was 80. But it really doesn't seem that warm. I have no idea what it gets to by noon -- must be pretty high though -- but at night it cools off again. I went on another week-end trip to NhaTrang. Had a lovely time. Now my friend Romy and I are talking about taking a trip to Manila sometime before she leaves in August. I don't know for sure if I want to though as I do want to go to Australia and take most of my annual leave for the year for that trip, stopping in Singapore, Bangkok, etc. en route. Well, gotta get back to work. Thanks again and hope to hear from you soon. Sydamelhnan lu-los Riojeestan, joka fali Jo 2 cridlra sitten. O - lin nun lornen Saa's dess ani Sinulta kiojeca! Eei ole vain tullut fein ortcllua.